Double, double, toil and trouble! Clair the Good Witch’s spell backfired and she turned into a cat (the main ingredient, toad warts, must have leaped past the expiration date). To reverse the spell, Clair will need to drink the hot green potion bubbling in the cauldron. 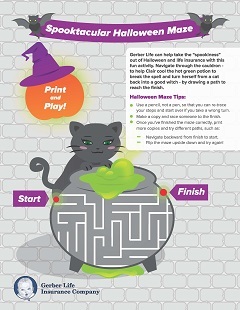 Help your child navigate through the cauldron from start to finish to cool the potion so that Clair can drink it to break the spell. Then, visit our website to see that it’s easy – not spooky – to learn how the Gerber Life Grow-Up® Plan1 can provide your child with whole life insurance protection for up to a lifetime (no toad wart concoctions required). While you’re there, be sure to download our free Halloween coloring book for “Spooktacular” fun with your child!